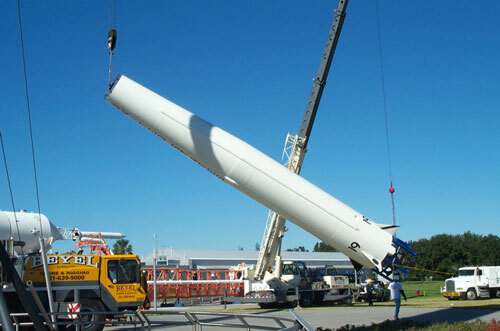 Choose2Go The Rocket Garden at the Kennedy Space Center Visitor Complex is back to full strength with the erection Friday of the Thor-Able booster damaged in last year's hurricane season. During the storm, the upper stage was blown off and damaged beyond repair. It was used to create a fiberglas replica, which now tops the Thor. The Juno II, which was completely blown over, was repaired and placed back in position earlier this summer. This work was accomplished by Guard-Lee of Apopka, Florida, who also created the Orbiter Explorer that is at the VC. Great timing! I was there today, (Dec.3) and thought it looked brand new, but had no idea it was erected just yesterday! If I remember the info plaque correctly, is this a Delta rocket? And since you live down there and mentioned orbiter 'Explorer', do you have any idea what became of orbiter 'Ambassador' that used to be on display there in the early 90's? It was located at the edge of what now may be part of the parking lot or even a bit farther in where the Debus Center/Early Space building is now. Could it be that it's the same one? Also at the same time, there was a LM mock-up located near where the Apollo 11 Service Arm is now. It was good to meet you there today, Rob. I remember the "Ambassador" when it left in 1993 or 94 it was headed to Korea. Where it is now I don't know. 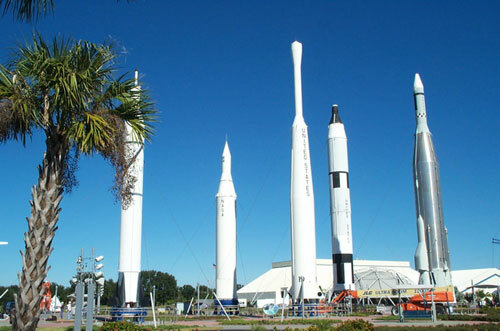 I think the LM mockup from the rocket garden went to the Apollo V Center. Maybe the Lunar Theater? Robert M Blevins At the Oregon Museum of Science and Industry in Portland, they have an exact replica of a Mercury capsule. The controls and switches and gauges are all original. Not only that, but OMSI is a hands-on museum. You can climb inside, shut the door, and imagine you are John Glenn or whoever. just build yourself a bigger ladder." 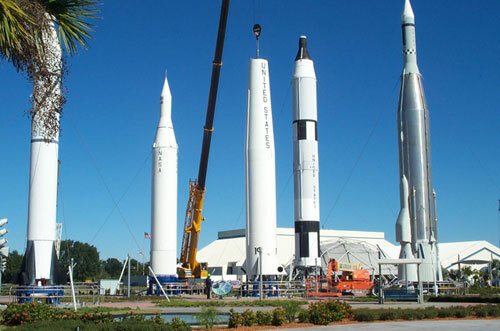 I heard on the grapevine that it ended up at or near the Stennis space center, possibly in a park. The only one at the Saturn V center that I'm aware of is LM9, the original LM for Apollo 15 before 15 became a J mission. the 'Ambassador' orbiter was sent to several countries, winding up somewhere in South America. Word I got is the cockpit section has been gutted (stolen) and no plans to reerect the model.